Hilgard O’Reilly Sternberg, a professor emeritus of geography at the University of California, Berkeley, who was considered the dean of Amazonian geography, died Tuesday, March 2, of natural causes in Fremont, Calif. He was 93. A resident of Berkeley since 1964, Sternberg was a native of Brazil, where he explored and studied the Amazon River and the people living along its banks for more than half a century. He not only wrote about the Amazon’s physical geography, ecology and anthropology, but also about its history and politics. His emphasis was on how human society affects the environment, such as by improperly using the soil, water, flora and fauna, or by concentrating resources in the hands of only a few people. It was only natural that Sternberg became a vocal defender of the Amazon against environmental despoliation. He wrote and lectured worldwide on deforestation and other ecological problems there, and documented many of them with photographs. He often criticized the Brazilian government’s actions in the Amazon, such as its reliance on large dams to relieve the effects of recurrent drought in northeast Brazil and plans in the 1990s to channel the Paraná and Paraguay rivers, which would have severely affected a vast and flourishing wetland known as the Pantanal. From 1944 until 1964, he served as chair of geography of Brazil at the University of Brazil in Rio de Janeiro, where he founded the Center for Research in the Geography of Brazil. In 1964, he joined the UC Berkeley geography faculty, where he remained until his retirement as an emeritus professor in 1988. He continued to read and write about the Amazon until a few weeks before his death. A member of the Brazilian Academy of Science and a fellow of the American Association for the Advancement of Science, Sternberg also received Brazil’s highest honor, the National Order of Merit, in 1956. In 1998, he was awarded the Great Cross of the National Order of Scientific Merit by the government of Brazil for his contributions to the scientific development of the country. Sternberg was born in Rio de Janeiro on July 5, 1917, to a German father and an Irish mother who had immigrated to Brazil a few years earlier. He was named after a person his father admired: Eugene W. Hilgard, a pioneering soil scientist who guided UC Berkeley’s College of Agriculture in the latter part of the 19th century. After receiving a bachelor’s (1940) and master’s (1941) degree – each one in geography and in history –from the University of Brazil, which subsequently was renamed the Federal University of Rio de Janeiro, he pursued graduate studies at UC Berkeley and Louisiana State University (LSU) before being called back to Brazil to become chair of geography and history. He subsequently earned his doctorate from LSU in 1956 with a thesis on the Mississippi River, and a doctor of geography degree from the University of Brazil in 1958. At UC Berkeley, he was influenced by the holistic approach to the study of humanity’s impact on the environment that was epitomized by famed geographer Carl O. Sauer. Expressing a deep concern for the destruction of Earth’s diversity, Sauer emphasized the need for “human stewardship” of the earth. Sternberg had his first contact with the Amazon in 1944, upon his return to Brazil. He dedicated most of his professional life to that region, publishing many articles and books on the subject. “The Amazon is something that grabs you,” he once said. 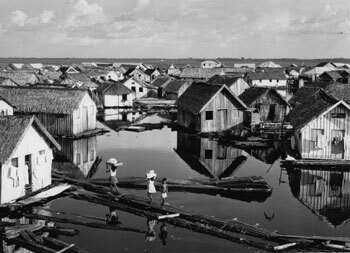 The 1956 book “Water and People in the Floodplain of Careiro,” broke new ground in its approach to the Amazon River, focusing on the Careiro – a side-channel, or paraná, of the Amazon, near Manaus – and the people living along its banks. The book was republished in 1999 by the Emilio Goeldi Museum in Belém with a new polemical introduction in which Sternberg defended his views on the discipline of geography, pointing out what he saw as missteps in the direction taken recently by the field. It was widely and internationally reviewed. “Never before had an Amazonian region been researched with such a unifying concept. In this sense, therefore, the work is a pioneering one,” wrote Harald Sioli, director emeritus of the Max-Planck Institute for Limnology, in his presentation of the reprint. In 1956, Sternberg was executive secretary of the International Geographical Union and organized the International Geographic Congress in Rio, the first such congress in a tropical nation. In 1963, he organized and led a project that brought together the University of Brazil, the Brazilian Navy and the U. S. Geological Survey to, for the first time, measure the flow of water and sediment in the Amazon River. In the 1990s, he began studying the causes and significance of forest fires in the Amazon, such as those that spread a canopy of smoke over the region in the wake of a drought. A prolific and meticulous writer, he was also a “generous busy-body,” according to his son, Ricardo. He would often, unasked, go to bat for people, such as the time he instituted a successful letter-writing campaign to increase the pension of a retired Brazilian colleague. Sternberg was professor emeritus of the Federal University of Rio de Janeiro and a visiting professor at universities in Heidelberg, Beijing, Mexico and Stockholm, among other places. He received the Berkeley Citation in 1988 and a Honoris Causa from the University of Toulouse in 1964. He is survived by his wife, Carolina da Silveira Lobo Sternberg; sons Hilgard O’Reilly Sternberg Jr. of San Francisco, Ricardo Sternberg of Toronto, Canada, and Leonel Sternberg of Miami, Fla.; and daughters Maria Ines Mangiola of Fremont, Calif., and Cristina Rausch of Martinez, Calif.
A mass in Sternberg’s memory will be held at 10 a.m. on Saturday, March 12, at Newman Hall, 2700 Dwight Way, Berkeley, followed by a 12:30 p.m. reception at the Women’s Faculty Club on the UC Berkeley campus.